The first consumer level large format printer just announced they’ve raised twice as much as their funding goals on Kickstarter. Gigabot, the first product from Austin-based startup re:3D brings huge sized prints to a low price point. The build envelope is a massive 600 x 600 x 600mm (24 inches cubed). The rigid aluminum frame gives the stability the machine needs to still be able to print in the 100 micron layer resolution expected of 3d printers, even with the large format. It supports 1.75 or 3mm filament, and they recomment using PLA. The printer uses the Marlin branch firmware, so you can use whatever slicer program you’re comfortable with. 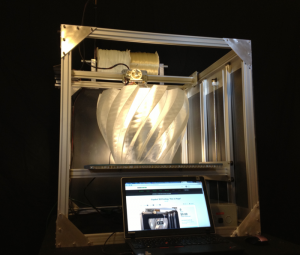 Critical to the success of printing on the gigabot will be calibrating its bed correctly. Even being slightly off will cause major issues. While the design is open format, one of the first things you’d probably want to do is make a cover for the print bed, otherwise heating it might take a while. If you want to ruin the aesthetic, the machine would probably benefit from enclosing the print area. Finally, stock up on some extra ram for your slicer computer. Generating the gcode for enormous prints will put some stress on your machine and the slicing software. The lower tiers are all sold, so the lowest you’ll be able to get a Gigabot for is $3,250 as a kit, or $4,000 assembled. They expect to deliver the first Gigabots late 2013.